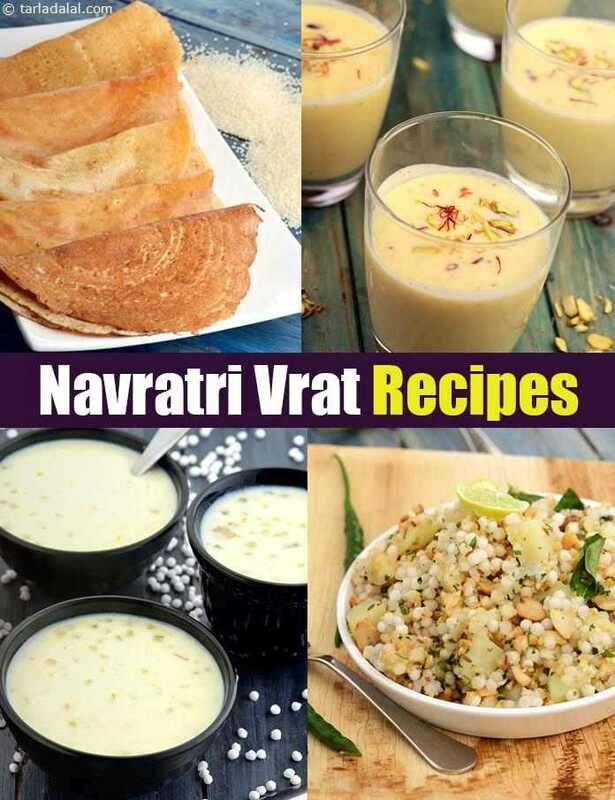 Navratri Recipes, Navratri Vrat Recipes, Navratri Food recipes: Navratri, the nine days when India and Indian souls across the world are charged with spiritual fervour is a time for worship, festivities, fasting and spiritual enhancement. There are two Navratris. One occurs in March-April, and the other in September-October. The first is called as Vasantha Navratri while the other is called Sharadha Navratri in the South and Dusshera in the North. In South India, the festival celebrates the victory of Shakthi over the demon Mahishasura, while North India celebrates the victory of Rama over Ravana. In either case, it is clearly the victory of good over evil. South Indian Navratri is a total gala celebration spanning nine days, the first three days glorifying Durga, then Lakshmi and finally Saraswati, the three key forms of the Goddess. The tenth day denotes the unification of the three forms into one primordial force that vanquishes evil. Many families have a practice of keeping a doll display at home, while others focus on pujas alone. In either case, South Indians generally invite other women to their homes and honour them by giving them haldi and kumkum. The guests are served sundal (a dish of boiled pulses tempered traditionally and garnished with coconut) and some sweets too. Elaborate pujas are held every day, in the mornings and evenings, at homes, and in temples and other community centres. In North Indian Navratri, people perform pujas and observe fasts during the initial days of Navratri, while the last few days are celebrated as a community event culminating in the burning of Ravana’s effigy on the last day. Durga Puja of Bengal requires no introduction as it is a grand event that has gained international fame. People come from across the world to witness the grandeur with which Maa Durga is worshipped there. All over India, Navratri is a busy time. Women, especially, have multiple dimensions to handle, from the pujas and religious activities to social gatherings and of course, fasting too! Like feasting, fasting is an art too. While fasting properly is a great way to cleanse your body and tone your soul, doing it wrong can make you tired and irritable. Nothing can be worse than doing it wrong for nine days at a stretch! So, we dedicate this article to fasting recipes, which will ensure that you stick to all the religious guidelines while still supplying your body the required energy and nutrition to go about its activities robustly. Once you know which ingredients are to be avoided, you can comfortably replace them with permitted ingredients and prepare tasty foods, ranging from snacks and sweets to one-pot meals. Generally, grains like rice and wheat, and sea-salt are avoided. Instead, flours like singhada atta, milk products, potatoes and fruits are consumed. Several interesting dishes can also be prepared with these ingredients. This article provides an appropriate selection of khichdi (one-pot meal), thalipeeth, pancakes and kadhi recipes for you to fast healthily. Try Sabudana Khichdi, Sabudana Vada, Rajgira Puri, Sabudana Vada Stuffed with Coconut Chutney. Try them out, to make fasting more enjoyable this Navratri. Navratri Recipes, Navratri Vrat Recipes, Navratri Food recipes, Try our other festival recipes. An exotic recipe made using the traditional upvaas (fasting) ingredients – potatoes, kand, shakarkand and paneer. The minty marinade gives it an elegant touch that will remain fresh in your memory for long.